Any smart business owner knows that restroom hygiene and first impressions are an essential part to maintaining a healthy clientele of repeat business. As bottom lines go, no matter how good the service or excellent the cuisine in any fine restaurant may be, if a business’ washroom doesn’t smell clean, let alone appear clean, the whole experience is committed to memory as negative. Unfortunately, the problem has been that most if not all business owners have found it hard to find a fully effective, continuous air care solution through janitorial supply houses or retail and wholesale suppliers. Specifically, metered aerosols and hand-applied air freshener sprays are costly, not environmentally friendly, not easily recyclable and as a result increasingly on their way out; plug-ins are limited in their capability and are potential fire hazards; and most other “so-called” odor solutions don’t provide an effective, hassle free solution that lasts longer than a few weeks. Even more, while many solutions and systems claim to permanently neutralize malodors, they don’t attack the odor at the molecular level nor in a continuous automated fashion; rather, they often employ hand-applied sprays and mopping solutions which are said to create an anti-microbial and biological-digesting action, but allow the odor to persist, causing the business owner to be reliant upon efforts that only temporarily mask smells rather then permanently eliminating them. So where does a business owner turn for a fully effective air care solution? Read on about statistical facts of how damaging odorous restrooms can be to a business’ bottom line, top consumer complaints, the molecular power of Air Scent’s exclusive Metazene® odor neutralizer, as well as the ins and outs of the commercial grade, Odyssey Fan-Operated Air Freshener system and how it provides 30 days of continuous, highly effective, “set-it-and-forget-it” performance — or, contact our team today to order any of our air freshening or odor neutralizing products at 800-247-0770 / +1 412-252-2000. 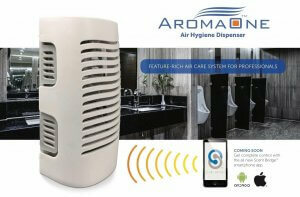 Please Explore Our Aroma One Restroom Air Freshener As Well! According to a recent survey, most American consumers believe that an unclean and/or smelly bathroom tarnishes the image of a business and that it sends a nerve impression to the brain that the company doesn’t care about its appearance or its customer base. The bottom line of all bottom lines if you are a responsible business owner — you should care enough about your restrooms so that they smell their very best. However, the task of developing a new, fresh scent in a restroom is challenging even for the best of fragrance masters, and it requires a blend of caring, years of professional knowledge and a plethora of scent branding artistry. To the uninitiated, it might seem easy to remove a bad odor and replace it with a new one, but it isn’t. It is much more difficult. Air fresheners are fragile instruments, their scents delicately manipulated in order to eliminate rather than just mask a bad odor. They must annihilate the smell molecularly with the application of another that consistently whispers of cleanliness and freshness (more on how to permanently eliminate odors ahead). According to a survey conducted by the Bradley Corporation, a leading manufacturer of bathroom furnishings for more than nine decades, almost three-fourths of consumers believe that a poorly maintained and smelly bathroom is a sign of bad business management. About two-thirds of consumers indicated that such a situation lowers consumer opinion of the company [or facility] by many points. Money-wise, an unpleasant smelling bathroom can cause a significant loss in sales when factored in to the survey results, which indicated that 64% of Americans admitted they weren’t likely to patronize that establishment ever again. This fact alone can become the demise of any business, especially restaurants. The survey demonstrated how fearful many Americans are about germs, with 64% of participants admitting that they don’t touch the lever and flush instead with their feet. Some 60% use a paper towel when touching the restroom door and 48% admitted that they both open and close restroom doors with their hips! Certain bathroom surfaces seem to create revulsion of the malodor and avoidance among many users. Door handles, stall doors and faucets top the list followed by countertops, sinks, and soap and towel dispensers. Further, Americans have long cited their concerns over the lack of hand washing in the food and health industries. Seventy-six percent of survey participants were quite perturbed about anyone not washing their hands in restaurant bathrooms, while 65% focused their concerns on restrooms in hospitals, clinics, doctor and dentists’ offices. Ironically, even though the restroom facilities may actually be clean, the majority of users admit if a bathroom smells bad, they don’t want to touch anything, and the first impulse is to not only leave, but also never come back. With all of these challenges in mind, our team at Air-Scent set out years ago to create a precision-driven, restroom air care system that not only decimated malodors at their molecular level, but also provided economical, professional air freshening services with a set-it-and-forget-it system for consistent air care across an extended period of time. That system, which has been serving a global clientele for decades, was named The Odyssey Fan Air Freshener System. Designed specifically for any malodorous situation, The Odyssey has become the most reliable in the air care industry today and, due to its unique system, is superior to any other of its ilk. It attracts odors like a magnet, and not only targets but also captures the odor-causing vapors, which become neutralized in the vapor phase. Included in this arsenal is a powerful substance called Metazene®, which has been designed to decimate the actual molecules causing bad odors at the molecular level. Other systems suggest they kill the malodor, but studies show they don’t, resulting in a fragrance blending with a malodor in an attempt to mask the smell — a smelly proposition to say the least. We don’t mask odors at Air-Scent; we kill them entirely. It’s the blend of the Odyssey’s design with the use of Metazene that culminates in a fully effective air freshening system with 30-days of continuous, automated, commercial grade performance. The dispenser’s European design has three-way ventilation providing maximum airflow. The durable polymer is both vandal and dust-resistant, and consumers can choose from four sleek color options: white, black, almond and gray, or in volume, any color can be matched. The Odyssey Air Freshener is available through our large network of professional providers and comes in three styles: the DC Battery Fan Dispenser: the Passive/Still Dispenser and the high volume DC Electric Fan Dispenser. The Battery model can accommodate both small and medium-sized rooms. A four-blade fan is also available on request. The Passive/Still Dispenser operates on natural airflow and evaporation. The powerful DC Electric Dispenser has more than triple the output of the battery version and effectively services large areas. This all adds up to a precision-based approach to professionally annihilating odors and providing the most effective restroom air care system in the marketplace today. In 1946, Bob Surloff invented the fan operated air freshening system, and Air-Scent International was born — so was precision commercial air care. Today, there are many delivery systems on the market, but only one truly effective solution. That’s because only Air-Scent provides the ability for you to match the precise fragrance to the precise delivery system to handle the proper application, from the washroom to the office to entryway, lobby or any other environment. Precision is our passion. We develop, manufacture, and distribute our world-renowned, patented systems and refills so that we are able to maintain every phase. Additionally, we’re the only air fragrancing company with its own full-service, internal fragrance house, allowing us to formulate customized scents that meet our customers’ needs. Even more, we’re the only air fragrancing company with a service division, so we can always make sure our products are real world and road tested. We have a professional, on location service division, so our products are continually being professionally tested on an ongoing basis. We don’t just make it and say it’s great, like many of our competitors. Not only is there proof in the pudding, but there are more meat and potatoes in our quality products. It’s no accident we offer 30-days of effective air freshening and odor control. Our products are precisely designed to create a pro table monthly air care service program; they’re professionally installed and maintained to solve virtually every air care challenge. Air Scent refills are produced in a multitude of forms, including liquid wick, solid square wafers, Surcotta disks and 60-day migratory membrane cartridges. Sliced Grapefruit: Pleasantly sweet with a touch of tangy tartness, this bathroom scent is energizing without being overpowering. Its citrus base note evokes freshness and cleanliness, two vital elements in restroom hygiene. Island Breeze: One whiff and you are lying on glistening sands under the swaying fronds of a palm tree, somewhere far away, warm and exotic. A top note of floral dominates this scent that blends sweet jasmine, violet leaves and lily with woody amber. Orange Frosty: Images of early morning sunshine and a world wrapped in winter collide with the exhilarating zest of fresh orange and cozy, warm and sweet vanilla. A top note of citrus reinforces the scent as the epitome of clean and fresh, which is so vital to effective restroom air care. Fresh Linen: This is a powerfully nostalgic and clean cotton scent that is evocative of fresh linens on a clothesline swaying in the summer breeze. Notes include: jasmine, soft, sweet and rosy peony and aromatic French vanilla ending with smooth subtle base notes of powder and Egyptian musk. Red Ripe Raspberries: Alluring and mysterious, the unique, spicy, sweet and fruity top notes of this fragrance bring to mind the rich and colorful bounty of summer and the eternal nature of the seasons. The tangy and slight woody base notes recall images of fleeting summer rain, glistening forests and lush green meadows. Zesty Orange Rind: This energizing burst of fresh, citrus screams ‘clean and fresh’ like nothing else. It is a sharp, invigorating scent with tangy and fruity top notes that blend into woody-herbaceous undertones. Reminiscent of warm tropical breezes floating over groves of citrus, this powerful scent speaks volumes about spotless and sanitary restroom hygiene. Wild Cherry Blossoms: The mystical allure of ancient Japan, where for centuries the cherry blossom tree was revered as a symbol of mortality, is ever present in this intriguing scent. The top notes range from powdery, sweet and lightly tangy to creamy floral and fruity. This indelible aroma has notes of sweet ripe cherries and just the hint of rose. It is an unforgettable yet ephemeral scent that evokes images of ephemeral beauty and colorful Oriental flora. Melons & Berries: The bright, sweet and juicy aroma of ripe melon comprises the top note of this pleasant bathroom air freshener fragrance. The berries add a fruity, sugary nuance that lingers in the air like a sweet-smelling breeze sailing across a verdant meadow in early spring. Spiced Apple Jack: Even though this scent is more or less seasonal and associated with the rich colors and musky nuances of the fall season, it works well as a restroom fragrance because it is both pleasant and memorable without being overpowering. The crisp warm apple scent is inviting and layered with notes of cinnamon, clove, nutmeg and ginger. The vanilla base note renders the aroma intoxicating, rich and long lasting. Lemon Burst: The power of citrus dominates this fresh, somewhat sweet aroma that transports the senses on an olfactory carpet ride to the lush and plentiful lemon groves found in the warmer regions of the world. Freshly squeezed lemon symbolizes gold standard bathroom hygiene and cleanliness. Inhaling this scent sends a message that this bathroom is well cared for and that those who maintain it consider consumers to be an important asset. Muscadine Grapes: This intriguing and intoxicating bouquet of aromas mimics the fragrance of a small cluster of large purple grapes. The scent is sweet but not cloyingly so, and its affect is very potent with its musky undertones. It is an uncommon fragrance, and one that is likely to keep restroom users guessing and perhaps even asking questions about. For many restaurants and other commercial establishments, poor or substandard bathroom hygiene is the leading cause of “customer attrition”. On the other hand, well-maintained restrooms attract repeat customers who associate clean washrooms with the quality of the company or service. Even though 2016 marked a period of continued growth in the air care industry, complaints by consumers about smelly bathrooms have persisted as stubbornly as the odors themselves! So if you’re a business owner, a professional air care specialist or a distributor — what are you waiting for? Call us today and find out more about our Odyssey Fan Air Freshener and odor neutralizing systems.